These are turning into my favorite posts to write. I just love hoarding up finished products and it really is encouraging me to try different things in order to accumulate these items. This has definitely helped me rediscover some old favorites (Aveeno Clear Complexion Moisturizer!). Also if anyone was ever wondering I cap each monthly at 15 products so there are roll-overs. I do it this way because otherwise some months I'll have 30+ items (I always seem to finish everything at the same time..) and then other months would just have one or two. This month ended up being all skin and hair products and no makeup! Interesting. I guess I have been using a bunch of different things equally? Anyways, on with the show! Equate Polish Remover and Cutex Polish Remover. Lumping the first items together because they are just nail polish remover. I really blow through these bottles quick since I change my nails weekly and now that it's warming up, I keep those toes in pristine condition too. As usual I have no preference to remover brands and typically just grab what's cheapest. Coconut Oil. Finally finished up this jar. It doesn't look quite used up but what's left is pretty much cemented to the glass and it doesn't seem worth it to scrap it off. Already purchased another one of these guys and I don't think I will ever stop. Marc Jacobs Dot Perfume. Never thought I would have a full on perfume empty to share! But this is my favorite perfume it smells wonderful, I describe it as peaches on a summer picnic, it's just so lovely. I was lucky enough to get another full sized bottle of this as a Christmas present, but even if I didn't I probably would have repurchased it. Pretty much my signature scent at this point. Kiehl's Olive Fruit Oil Hair Pak. You can read my full review here but it's really no secret I'm obsessed with this stuff. Not too crazy about the price so I'm waiting for the free full sized product gift deal that they have at Kiehl's to pick this up again. Ojon Rare Blend Deep Conditioner Sample. This is another favorite of mine, it feel so luxurious to use. Already redeemed some Birchbox points and picked up a full size of this stuff. Noya Vanilla Lip Balm. This smelled delicious, like a wonderfully rainbow sprinkled vanilla cupcake fresh out of the oven. However, it was very drying on my lips, so despite the creamy texture that I adored, this will not be something I will repurchase. Garnier Gel Cream. Hands down the best daytime moisturizer for me. Very lightweight and hydrating, I always stockpile this stuff so I never have to go a day without it. Baby Lips Dr Rescue. I actually really liked this colorless original mint, I believe it's called So Cool. I have a ton of different chapsticks and balms to use up but this may be one that I go back to. Serge Normant Dry Conditioner Sample. This stuff is pretty neat, it really does perk up my hair but realistically I put very little product in my hair so it doesn't make sense to actually buy a full size version of this. I do have another one of these sample cans so I will be enjoying the perks of dry conditioner until it's all used up! Biore Pore Strips. A lot of people say these things don't work, but I see lots of gunk on the strip after I'm done with it and that's slightly gross but really satisfying so I like them. These also get stockpiled so I already have more. Aveeno Clear Complexion Moisturizer. This was a favorite for me through college and we have rekindled our relationship. This works wonderfully as a nice thick nighttime moisturizer and I already got another bottle to replace this one. Ren T-Zone Samples. One was a cleanser and another a gel (toner? ), I really didn't see any change in shine so definitely won't be going out and purchasing these. Nume Hair Mask Sample. I got this in an Ipsy bag I believe, I didn't feel like it did more than a regular conditioner did and it had an interesting smell to it. I'm interested in trying the Hydro Punch mask, but this one that is seriously just called Hair Mask, I will skip. Secret Deodorant. First, awkward on the misspelled word in the image (damn you autocorrect..for not catching it! ), and second this oh so very summerberry is the best smell ever. It compliments my perfume of choice nicely and after the vanilla fiasco, this is the only scent I will ever buy again. 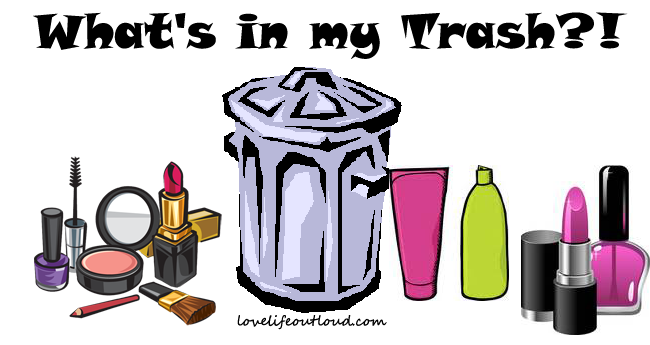 What are some of your empties from this month?